The Skilled Trades (TIE) report provides the economic and labor analysis for the occupations that are part of the skilled trades industry. It includes quantitative data about the labor market, as well as qualitative insights gathered through an online survey of industry leaders, facilitated group discussions, individual interviews with business leaders and two work sessions conducted in 2017. This report provides a workforce action plan for the KC Global Design Talent-to-Industry Exchange (TIE). 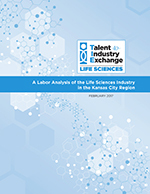 This report provides the economic and labor analysis for the first TIE, which focuses on life sciences industry in Greater Kansas City. It includes information from business engagement that took place in late 2016. This report provides a workforce action plan for the Life Sciences Talent-to-Industry Exchange (TIE). 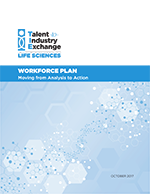 This workforce plan — built on business-led discussions and using both quantitative and qualitative data — outlines strategies identified and prioritizes two “big ideas” to move forward immediately. Career prep programs can put students on the path to success by offering experiential learning, industry-recognized credentials and college-credit courses while students are still in high school. Career & Tech Education prepares students for what’s next, whether they are on the path to college, a first job, or both. 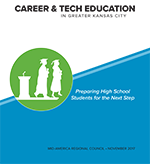 This report was created in response to community demand for information about Career & Tech Education and ways to develop workplace competencies beginning in grades K-12. 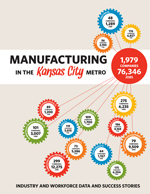 It presents a snapshot of regional CTE in the Kansas City metropolitan area. To have a significant impact on the regional economy — and on the quality of life of those who complete degrees — postsecondary attainment must lead to quality jobs in key industry sectors. Building strong connections between education and industry requires a clear understanding of currently available educational credentials. The Education Asset Inventory captures the post-secondary credentials available in the Kansas City region for five industry sectors that are particularly important to the regional economy. With support from Lumina Foundation, GradForce KC and the Council for Adult and Experiential Learning conducted the first inventory in 2015. MARC and GradForce KC now update the inventory annually. KC Rising is a joint initiative of the Civic Council of Greater Kansas City, Kansas City Area Development Council and Mid-America Regional Council to create a long range vision for regional prosperity. In 2015, this initiative was organized around three key economic drivers: Global Trade, Innovation & Entrepreneurship and Human Capital. This initiative engaged nearly 200 volunteers to develop a regional business plan. Business leaders were interviewed as part of the KC Rising initiative. This slide set, prepared by Clear Box Insights, is a summary of interview findings. The report includes a description of the advantages and disadvantages of doing business in Kansas City and the findings related to human capital capacity. 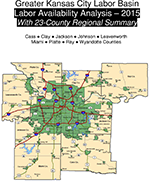 Created in July 2015 for the Mid-America Regional Council by The Docking Institute of Public Affairs of Fort Hays State University, this report provides labor basin labor availability on the Greater Kansas City Labor Basin, which includes nine counties in Kansas and Missouri: Cass, Clay, Jackson, Platte and Ray counties in Missouri; and Johnson, Leavenworth, Miami and Wyandotte counties in Kansas. 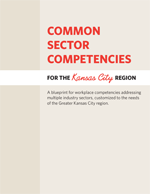 This report also provides information from the 23-county larger region adjacent to and including the Greater Kansas City Labor Basin and includes data from previous labor studies conducted in the area. • Preparing students for postsecondary success. • Achieving meaningful credentials and degrees. • Growing a skilled workforce to meet industry needs. 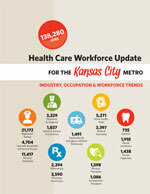 Published in March 2014, this report provides 2013 industry and workforce data on health care in the region, including emerging trends, top employers, projected industry growth, top skills and certifications sought by employers, and annual income by education level. 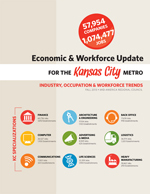 Using September 2013 data, this report summarizes industry, occupation and workforce trends for the Kansas City metro, with a special emphasis on those industries that the region specializes in. It shows how we compare to peer metros in those industries, what kind of growth we can expect in the next decade, and what skills and certifications are most in demand. 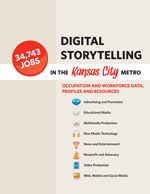 This June 2013 report includes occupation and workforce data, industry profiles and training resources for the field of digital storytelling — using computers, digital and web technologies to create everything from mobile apps to feature films. It includes job skills in demand, median hourly wages, job growth projections and notable are employers in digital storytelling. Published in May 2013, this report provides industry and workforce data on manufacturing, including top manufacturers, projected industry growth, top skills and certifications sought by employers, annual income by education level, area resources and success stories.